is based on a design introduced in 1986. Over seventy million American Silver Eagles have been sold by the US Mint. 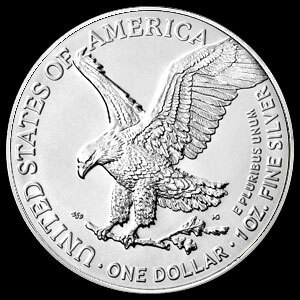 Silver Eagles have become the most popular bullion coin in the world because of the beauty, quality, and assurance of content by the US Government. The obverse features the famous “Walking Liberty” of Adolph Weinman’s 1916 US half-dollar, widely considered to be one of the most beautiful coins ever minted. The reverse, designed by John Mercanti, depicts an eagle with shield carrying an olive branch along with an inverse pyramid with thirteen stars, representing the thirteen original colonies. 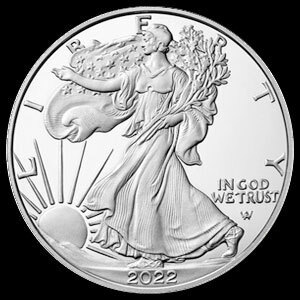 Each coin contains one ounce of .999 pure fine silver.